37% of internet users look online for information about health insurance, including private insurance, Medicare or Medicaid. The percentage of internet users who look online for health insurance information has increased slightly, but significantly, over the past two years. 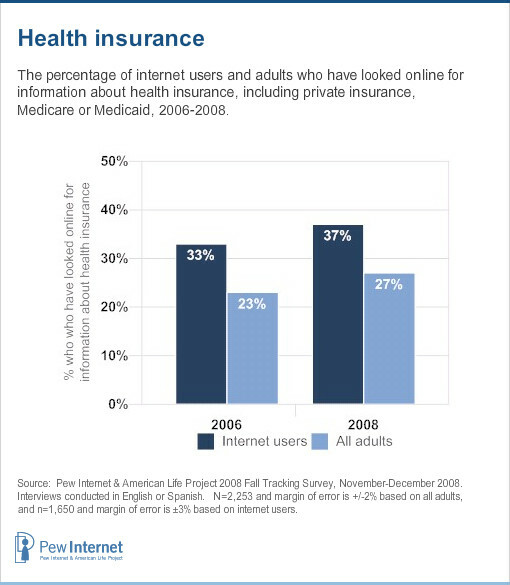 In 2006, about a third (33%) of online adults researched health insurance online, and, in 2008, 37% did so. Most demographic groups are about equally likely to look up health insurance information online; however, there are a few exceptions. Internet users age 65 and older are significantly less likely than younger age groups to seek insurance information – including information about Medicare – online. Less than a quarter (23%) of online seniors look online for health insurance information, compared with about a third (33%) of internet users 50-64 years old, 41% of internet users 30-49 years old, and 39% of internet user 18-29 years old. Additionally, the percentage of young internet users (18-29 years old) to search for health insurance information online increased considerably over the last two years, from 27% to 39%. 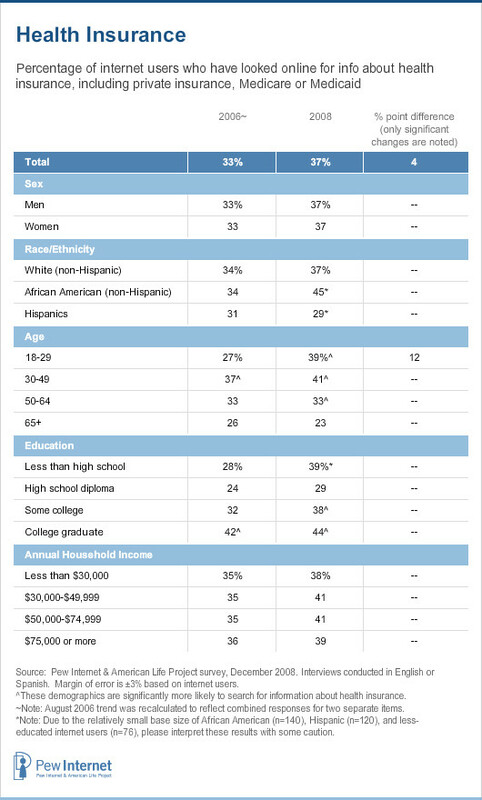 College graduates (44%) and internet users with some college education (38%) are also significantly more likely than high school graduates (29%) to look online for information about health insurance.